90s point-and-click adventure Myst will come to 3DS on 27th March 2012. In 3D, each scene jumps from the screen and really puts the player in the game! Well, we'll see about that in March 2012. WALNUT CREEK, Calif. – (December 22, 2011) – The seminal fantasy-adventure title, Myst, is set to arrive as a major player in the Spring 2012 lineup of Nintendo 3DS™ releases, announced video game publishers Maximum Family Games (MFG) today. The story of Myst was first created as a computer game series nearly two decades ago by brothers Robyn and Rand Miller of Cyan, Inc. The new Myst for Nintendo 3DS, developed by Hoplite Research, LLC, introduces the first-person fantasy universe to players not yet acquainted with the series, and gives veteran gamers extra content to explore with new landscapes and with the RIME Age added to enhance the Myst storyline. 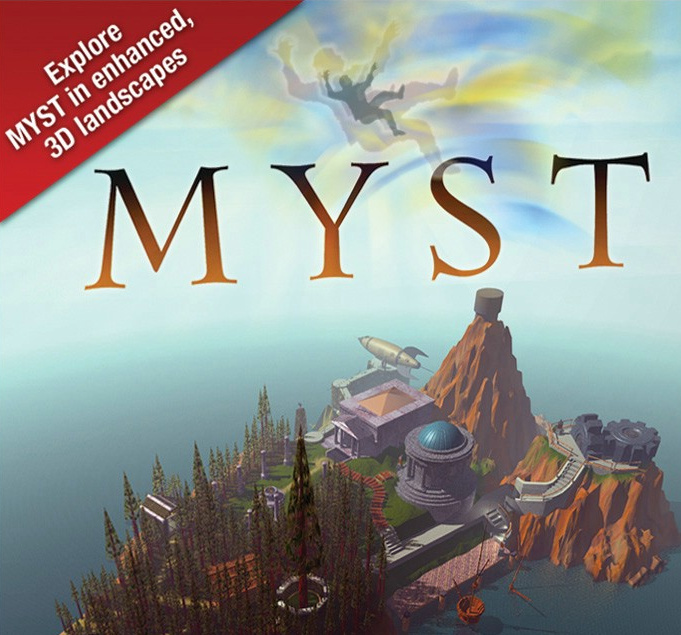 As in the original Myst, players will solve puzzles, explore their surroundings and interact with items and objects that deliver clues from which players must piece together answers in order to move ahead and solve the mysteries that lie within. While Myst for Nintendo 3DS stays true to the original game’s model, the upcoming addition takes the classic journey to a new level with sharp 3D environments which even further transport players into the enigma the game creates. The game begins as the book of Myst has just been finished and the reader finds himself in the unusual world described within the book’s pages. Exploration begins immediately, as players wander around in an attempt to figure out where they are, and more importantly, why they have landed on the cryptic island of Myst. Myst features six worlds, including the RIME Age which was not part of the original release, and with a multitude of puzzles and clues to uncover, Myst offers hours of adventurous gameplay. “In 3D, each scene jumps from the screen and really puts the player in the game!” said Manny Granillo, President of Hoplite Research. Myst is set to release on March 27, 2012 on Nintendo 3DS. The game is rated E for Everyone by the ESRB. For more information, please visit www.maximumfamilygames.com. eh. Can't this game be beat in like 30 seconds. I never have played any of the Myst games. I'm sure they would look a lot cooler in 3D. As much as i'm for both classic and new point & click adventures on the 3DS i can't see me getting this as a full priced retail game. It would be great for a very budget price or as an eShop download though. I remember my sister playing thr original version. She literally played that thing like the back of her hand. I wasn't as interested in the game personally. Nooo! While it may or may not be true, I think Myst and their ilk ruined adventure gaming with those 1st person environments, no NPCs at all to talk to (so boring to adventure by yourself! ), and horrible illogical puzzles that are worse than other adventure games. Sierra and LucasArts made the best adventure games back in their day. ...but then I realised that the first Myst isn't exactly the strongest in the series. Puzzles just aren't as satisfying to complete as in the later games, which REALLY reward you for slogging through difficult puzzles. And in terms of atmosphere it's trumped by its successors. If this was Riven or Exile they were talking about I'd buy that in a heartbeat. I'd also love to see Lucasarts or Sierra get their classics on the 3DS. It's great, but you have to apprecaite this game. Wasn't the Rime Age in the fully rendered Real Myst version already? I never understood this game on the DS, and eventually after just tapping away I somehow advanced to the next area completely on accident, with even less of a clue on how to continue or how I got there. Yeah, I didn't really like this game. I'm kind-of intrigued by all of this. On one hand, MYST in 3D would look really pretty, and if the movement system was more similar to that of Real MYST I would totally buy this game. But on the other, MYST is an extremely confusing game that doesn't deserve anything above the $15 mark. This might be a good pick-it-up-used game. My wife and I played this together. Now I wish I would have saved my notebook. We had diagrams and charts and all kinds of things written in it. Would be quite the interesting relic now methinks. The game can be beaten in thirty seconds, but the idea is to complete the game. Myst is more like an interactive novel. I remember playing Myst for the amzing atmosphere and punishing difficulty of its puzzles. I loved both. Curious how the 3D effect looks, but it has to be a lot better gameplay wise in comparison to the DS version. I would really love more adventure though, just no ports anymore. I really love the Myst series (you guys who think the game is confusing... it's a puzzle game. Confusion is practically the point), but I've played this game several times and I own the RealMyst version. I might rent it to check out the 3D appearance, I suppose. Also, saying the game can be beat in 30 seconds is misleading. Yes, if you know the answer to the ending puzzle, you can start the game up and get to the ending very quickly. However, if you know the solution to the final puzzle you've either worked your way through all of the game's other puzzles, or you're cheating — which is kind of like accusing Super Mario Bros. of being too short because you've entered a Game Genie code that takes you right to the final Bowser battle with invincibility turned on. When the 3DS was confirmed, I actually sent an e-mail to Cyan saying that they should definitely get in on it, and that it could be amazing. I hope they do RIVEN in 3D. That would be even better! I'm a big MYST fan, and I even have an age that me and some others are making for URU. I'm just hoping it turns out better than the DS game. Talking about relics from the past! It's quite some years ago since I last heard of this franchise. The franchise is as good as dead. This is just another port. Had this game for the PC in the 90's. Competing against the LucasArts and Sierra masterpieces, this was an odd pill. But I always came back and tried to understand what I was supposed to do. An interesting Adventure Game for sure, but difficult and puzzly. sure i saw the DS version in the bargain bin somewhere. I am very excited about this game. I'd like to see more adventure games on the 3DS! It's being released on the one-year anniversary of the 3DS (at least in the US).